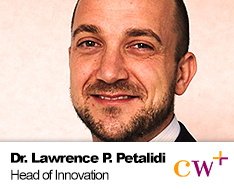 Lawrence is Head of Innovation and Impact for CW+, the Health Charity for Chelsea and Westminster NHS Foundation Trust. He is a NICE specialist advisor and a NHS Navigator for the Digital Health.London Accelerator. Lawrence manages a Grants programme that funds innovative, quality improvement and service transformation projects for Chelsea and Westminster NHS, aiming at improving patient care and experience. Recent digital health projects include remote patient monitoring, wearable and sensor pilots, medical device development, augmented reality in surgery, telecare and discharge process digitisation. Following a degree in Biochemistry and Neurobiology and a PhD in molecular neuro-oncology at Addenbrookes Hospital, University of Cambridge, Lawrence has 12 years of experience across business, technical sales, project management, commercialisation, change and innovation roles.